What Do Deer Need To Survive? Understanding this question leads to facts about this species, that has existed for around 3.5 million years. This is because of their astounding successful survivor skills and this has lived on through the millions of years. Now, this begs the question, What Do Deer Need To Survive. Considering the theory of evolution and adaptation changes, deer have something special. Something worth looking into why deer survive and am certain you can agree with me on this. Whitetail deer is the oldest of its species. Their area of strength is flexibility and the most common perspective of them is ecological generalists. Deer can survive by maneuvering around any environmental and climatic conditions, they could also eat all sorts of food depending on the situation in place. When deer are in groups this is possible, which is obviously their natural structure. Apart from their herbivorous habit, this species feeds on dead and live insects and birds, including the fish too. 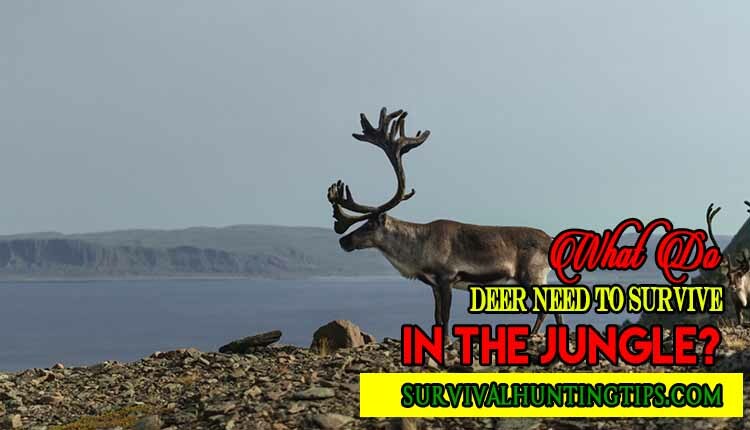 What Do Deer Need To Survive In A Harsh Environment? How Does Baby Deer Manage Under So Much Jungle Pressure? Deer are the greatest escape artists, which is a major component of its prolonged survival means. Using their high-speed sprint, deer survive by getting themselves out of situations, as they create obstacles between them and their predator. In other instances, they get themselves out of situations by playing tricks on their predators. For example, when deer spots a possible predator, they hide and remain calm until the pursuer comes closer thus making an explosive sprint. Deer survives by escaping through a well-known path before the pursuer gets a clue of where they have headed. In other times, they tend to go in circles, crossing each other’s paths, in order to delete their trail marks. They walk and submerge in water bodies to make their trail confusing. The other common escape style is running near or around other animals to get the predator focusing on another inferior prey. The trail might have obstacles but deer do not run through difficult paths they are not aware of. They choose escape routes that the predators will have a problem maneuvering but to them, it will be just detouring and jumping. Therefore, there is a possibility that its predator will kill a deer in a new territory. In case you were not aware, fawns are babies of deer. Fawns begin practicing their acrobatic survival tactics only a few days after they are born. With their flimsy fawn legs, they immediately jump up, twisting and landing at various angles until they firm up. They constantly do this and also practice escaping imaginary predators for a while until they are strong enough. Fawns usually lay low on the grass to avoid being noticed by predators when the deer go to gather food. Shortly after growing strong, fawns discover their speed. They sprint, flatting out, changing directions until they sharpen their swift movements. Unavailability of playmates cannot stop fawns, they always have their way around sharpening critical life-saving techniques on their own. This species is a fan of the woods, and this could be either swampy or dry. Another area that deer are found is around the borders of woods. Believe it or not, but this species can safely swim out of water bodies and could cover a distance of 5 miles which makes deer survive from predators that can’t swim. However, they would not survive on open grass plains but they mostly prefer this instead of the obstructing snow, which slows or traps them during an escape. Deer are just sprinters, dodgers and hiders when they work in groups. They usually do not cover long distances but rather put obstacles or use tricks on their predators. Their major concern is safety. Therefore, their habitat must have everything they require to give them a better chance of survival. They are very loyal and they stick to their own territories. However, they might scatter in case of danger or threat and later return to their habitat when it is completely safe. Otherwise, when the habitat proves no longer safe, they normally move to a new and safer location. Deer and their habitats have a very strong attachment, despite all these possible threats. This goes to a point of starvation, just because they do not want to leave their possibly barren territories. They would rather settle for competition than move to a better location when competitors invade their territories. Deer have not developed grazers like most herbivores. On their upper jaw, they have a cartilage pad, molars on both lower and upper jaws and incisor teeth on just their bottom jaw. With this kind of dental arrangement, they normally pull instead of shearing the grass like the rest of the specialized grazers does. They are also very selective about what they eat. They only eat foods with low fiber, such as vines, shoots, leaves, vegetables, fruits, plants, mushrooms, grains, mosses and nuts. Most of the foods this species comes across in the bushes are very poisonous, for example, tannin in oaks and acorns. However, this species eat these plants in small quantities or eat them while they are not fully-grown because, at that stage, they contain low levels of toxins. In case the food runs out during the winter, the diet of this species can turn into a starvation spree. They can feed on just about anything; they are capable of eating any form of undesirable or delectable foods they come across. This is a form of survival adjustment. However, filling their stomachs with indigestible food could lead to their deaths. Conclusively, understanding What Do Deer Need To Survive is much easier especially when you consider, seasonal transformations, habitat, a number of herd and food available. These are the key areas that the deer consider most for its survival. You could share your comment or view with us and all questions are allowed.